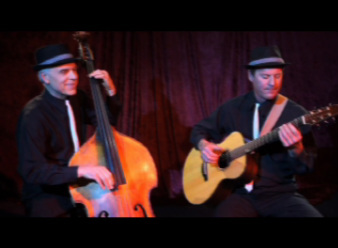 Hit Waves Unplugged is a one of the kind acoustic combo in Northern California: it started as a duo, acoustic guitar and upright bass. Although the band can also be booked as a solo guitar or 3 piece band (by adding either violin or Cajon/Percussions). In 2014, we added piano to the line up (see below for new audio samples). Late 2014, we added male vocals to the line up. We perform the hits from 1920 to 2014 in an acoustic ("unplugged") version. The band performs hits from Frank Sinatra/Ella Fitzgerald to hits from Michael Jackson/The Beatles/Police/Eric Clapton/Cindy Lauper and so many others.